Alice Cooper is quick to admit that his music doesn’t shock the way it once did. “It used to be so easy to shock an audience in 1971 and '72 because nobody had ever seen this kind of theatre,” Cooper recently explained on Italian radio program Linea Rock. In those early performances, he continued, “Alice gets his head cut off and the blood goes in the audience and there's chopped-up baby dolls … Now, I turn on CNN and I see a guy really getting his head cut off. That's shocking to me.” Nevertheless, on Paranormal, his 27th studio album, Cooper still rehashes the "shocking" subject matter that has peppered his output for the last 45 years - mental breakdowns, infestations, and other supposedly discomfiting phenomena - atop familiar musical backdrops that sound something like what you’d get if you programmed an algorithm to compose "hard rock of the 70s". From the title track’s plodding four-on-the-floor to the lazy electric blues of 'Fallen in Love' to the soulless, macho gang vocals that back Cooper’s choruses - the musical cues on Paranormal affirm the tired attitude articulated by the first lines of 'Dynamite Road': "Life is just a party, man, we’re just looking for a thrill / We are rock & roll and Detroit soul, with plenty of blood to spill." One of the album’s selling points is its final two songs, 'Genuine American Girl' and 'You And All Of Your Friends', for which Cooper reassembled the original lineup of the Alice Cooper band: Michael Bruce, Dennis Dunaway, and Neal Smith (minus deceased guitarist Glen Buxton). Those musicians are responsible for the legendary three-album run - Love it to Death, Killer (both 1971), and School’s Out (1972) - that made Alice Cooper famous, helped popularise hard rock and glam rock, and remains some of the era’s best music. The group’s two appearances on Paranormal echo that early stylistic approach, with hard rock riffs tied to a Motown-influenced attention to pop songcraft. But while they’re two of the album's best songs, they, like the previous ten tracks, suffer from not just overproduction and out-of-date musical aesthetics, but also a half-hearted attempt to assert something pure about the rock of yore. Coupled with Cooper’s assertion that rock music can’t really shock any more, the somewhat robotic music on Paranormal positions rock as inert, at best an escape to a time when it could rile its audience - even though part of the reason early Alice Cooper "shocked" in the first place was the band’s penchant for musical experimentation in concept, performance, and style. No, Paranormal is an empty gesture toward an idealised past, the rock equivalent of a certain popular phrase attributed to Donald Trump. To that end, it’s something of a political album. Cooper has long been reticent to share his political beliefs, unlike, say, his fellow Detroit-bred hard rocker Ted Nugent. "Rock is the antithesis of politics," Cooper once told an interviewer; last year he said he’d vote for Tom Hanks for president because the other options - Trump and Hillary Clinton - were stupid, and he preferred to separate himself from politics altogether. Yet that anatagonism to the processes of Washington politics is precisely what put Trump in the White House. As suggested by his reference to CNN, Paranormal’s anodyne efforts to shock rely on topics that affect the current American psyche. 'Dead Flies' depicts the gross imagery of its title, but it also contains lines like "Your phone knows more about you than your daddy or your mother." 'Private Public Breakdown' has Cooper proclaiming: “The secret service, I make them nervous.” 'Paranoiac Personality' says simply: "I’m smelling a conspiracy (you’re paranoid, paranoid) / Telling lies about me constantly (paranoid, you’re paranoid)". 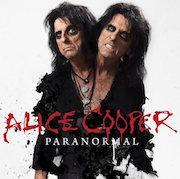 While lyrics such as those wouldn’t sound too out of place on any Alice Cooper record from the past 50 years (technological developments aside), when coupled with the nostalgic band reunion, rote musical compositions, and Cooper’s public disdain for the political system, the music becomes a potent aural document of today’s far-right political temperament. It’s a temperament that expresses "shock" at CNN, or at Kathy Griffin holding up a model of Trump’s bloody head, but one for which a presidential candidate mocking a veteran’s family - or even worse, pulling healthcare from millions of vulnerable citizens - registers as perfectly fine and normal. It’s a temperament based on outmoded morality, one that’s idealistic to the point of being childish (Griffin’s antics "shocked" the 11-year-old Barron Trump, as his father mentioned). Rock doesn’t need to eloquently tackle current issues, but it still exists within a specific climate; if it’s to shock - to upset the system, which it certainly still can - it should confront the dominant, repressive styles of the day through both form and content, not just toss out obsolete signifiers.